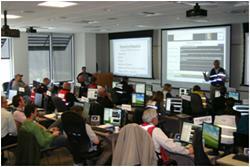 An Emergency Operations Center (EOC) is a central location from which local governments can provide interagency coordination and executive decision making in support of incident response and recovery operations. The EOC is part of a bigger system designed to support the County’s efforts to respond to more complex emergencies and disasters. The purpose of the EOC is to provide a centralized location where public safety, emegency response, county departments, community services, and other jurisdictional agencies can coordinate planning and support activities. 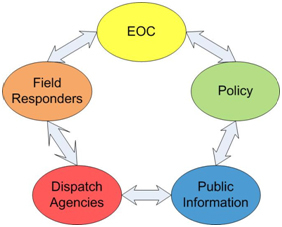 It is important to note, the EOC does not control the on-scene response, but acts as a support function for the response and is responsible for maintaining the "bigger picture" to address larger community related issues. To manage resource requests in support of first responders, hospitals, shelters, and recovery operations. The EOC is staffed by Emergency Management personnel and Emergency Support Functions (support personnel), who are subject matter experts in emergency services, community services, county infrastructure, and public information… just to name a few. Support personnel provide expertise on a broad scope to address first responder and community needs (i.e. food, water, sheltering, debris removal, rerouting roads, evacuation support etc...). The EOC also serves as a coordinated link between the Adams County Board of County Commissioners, Chief Elected Officials, Emergency Managers for local jurisdictions, field response personnel and in a large disaster, Tri-County Health Department, other counties and the State Office of Emergency Management. In 2012 the Adams County EOC was relocated to the Adams County Government Center after successfully receiving Commissioner support and grant funding from the State Office of Emergency Management. This move greatly improved the functionality and efficiency in the EOC as it created over 30 dedicated workstations that now have multimedia technology and state-of-the-art connectivity, all within a secure location. The Government Center provides the EOC with the ability to expand for larger events and readily connect to our county Commissioners and other critical partners in the building. The EOC remains in a constant state of readiness, so if a disaster occurs in the county, it can be activated in 1 hour to immediately provide support to emergency responders and community needs.